This training courseware title provides everything you need to professionally deliver Negotiating for Results training including editable training manual, hands-on exercises, exercise files, detailed instructor guide, classroom-ready PowerPoint slides, and unlimited online learning licensing. 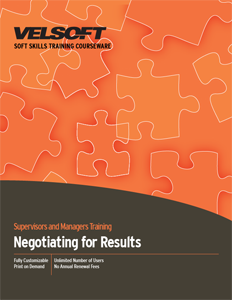 Seeing is Believing This sample manual to teach Negotiating for Results is in MS Word format. This is a one-day workshop that provides participants with an interactive approach to negotiations. The skills they acquire will help them in their role as mediator and negotiator as well as in their day-to-day responsibilities. Participants will be encouraged to focus on interests rather than positions, so they can develop relationships of mutual trust, fairness and respect for one another. This is a common-sense approach based upon developing a balanced and lasting partnership to solve workplace problems. Participants will learn and practice effective communication skills, problem solving and consensus building, with the intention of turning face-to-face confrontation into side-by-side problem solving. Develop skills that take the interests of both parties into consideration.